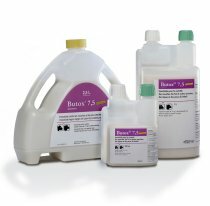 The Butox® range of formulations contains deltamethrin as an active ingredient. Deltamethrin belongs to the class of synthetic pyrethroids which resemble natural pyrethrins found in the pyrethrum plant. Natural pyrethrins are unstable and rapidly degrade in contact with water, air and light. Synthetic pyrethroids are more potent than pyrethrins, have a better knockdown effect and are repellent. Pyrethroids are biodegradable but are stable in air and water. Some of the other more common pyrethroids used include bioallethrin, cypermethrin, fenvalerate, flumethrin, lambdacyhalothrin, phenothrin, and permethrin. Most of the synthetic pyrethroids are combinations of trans- and cis-isomers. The cis-isomer has greatest insecticidal activity. Deltamethrin is a pure cis-isomer and is thus a powerful insecticide. Deltamethrin’s effect on the parasite is mainly through contact and ingestion. As deltamethrin is extremely lipophilic it easily penetrates the cuticles of insects and acarines.